Be a part of THE SHERIDAN STORY! To access our live-stream and sermons archive, head to our “SERMONS” page, where you can listen to and watch to recent messages from our community. Get your kids & youth registered via the links below! Well, it’s that time of year again when we need to start thinking about and planning for the coming new year! Two years ago, you may remember that we ran a Stewardship Campaign about “going to eleven”. 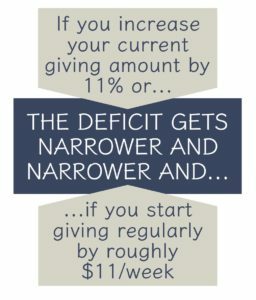 The idea was to increase giving by 11% so as to chip away at the deficit we’ve been running for years. That was a very successful campaign, and it did help trim our deficit. For the last three years we have sought to minimize our spending so as not to increase our deficit, but we also have worked to continue to invest into the life and ministries of Aldersgate, and need to continue to do so. The good news is that in all of that, our deficit has gone down, even as we have increased spending, all of which points to two things: Growth in the vitality of our community and your generosity. Thank you! Every dime you contribute to this community matters, and we are seeing fruit from the work we are doing. As we head into 2019, we need another 11% push! 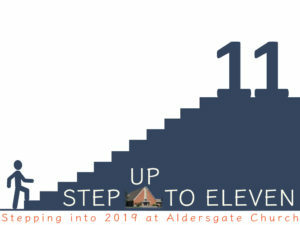 Can you help push Aldersgate forward in its vitality by “Stepping Up to 11”? By that we mean that we’re asking you to increase what you gave in 2018 by 11%. We are not asking you to give 11% of your income (although that would be great! A tithe and then some!). We are asking you to consider increasing what you’ve been giving by 11% (or more if you feel led!). If you have not been a regular giver or pledger, we ask that you consider “Stepping Up to 11” by starting to pledge and give at some level (maybe $11.00 per week, for example). Pledge Cards are available at church, or you can fill out an electronic pledge card by clicking here! Pray about this, look at your finances, talk with your partner about it, pray about it some more, and see where God leads you. Then on or before (the earlier the better!) November 25th submite your pledge, whether it’s on paper or electronically. Pledges really do help us plan better for the coming year, so we’d love to see them come in ASAP. Whatever it is you can give in 2019 will help us continue to foster this beautiful, authentic community who seeks to love God, love self, and love neighbor, as we reach out to heal a beautiful but broken world with everything we’ve got. So help us invest in the life of this community in 2019! If you have any questions about anything, don’t hesitate to contact me. Stay centered in God’s love, and we’ll see you Sunday!